PrezCon is a strictly board and card game convention that works much like the World Wargaming Championships (WBC). There are many dozens of tournaments with heats, sometimes semi finals, and finals, with plaques awarded for winner and sometimes for those who place depending on the size of the tournament. Players pay one lump sum to be able to play as many tournaments as they can squeeze in. If you just want to participate in open gaming the fee is a little less. The convention takes place in the Doubletree Hotel in north Charlottesville on US29. There’s enough choice in food that you can stay in the building for the entire convention. As most readers know I don’t play in tournaments - for the most part I figure if I want play games I can do it at home, so I’ve never been one to play games at conventions. When I have the opportunity I like to watch people play and sometimes talk with the players to try to help me understand the game more quickly than if I just spent the time playing one session. It’s a very friendly convention with many people who’ve known each other for years, but make no mistake there are many expert players, and if you are a tyro in a game where skill counts for a lot then you’re not likely to win much. There are many old-time wargames but also less serious games like Liars Dice and Werewolf. This year seemed less crowded than normal, but according to Justin Thompson, the Man in Charge, attendance was up at over 600. This compares with over 1500 at WBC, over 10,000 at Origins, and over 40,000 at GenCon. The convention used more rooms than in the past which may be why it seemed less well attended. It also seemed that there were fewer young people. The majority of attendees are folks who played wargames since they were quite young and are now in their 40s, 50s, and 60s. As is typical at such conventions the proportion of females is low. The convention begins on Monday but I arrived Wednesday evening. PrezCon has an auction and auction store on Thursday, and on first run through the auction store I planned to come back later that evening but was occupied with other things and so didn’t buy anything. On Friday, Saturday, and Sunday there are vendors selling games including some manufacturers such as Mayfair and GMT. Z-man was not there this year (a change resulting from its sale to a French Canadian company). Clash of Arms who are usually there were not not, but Worthington from the Norfolk Virginia area was. I also met some new people such as “Jeffro,” a fan of micro games including Dragon Rage. He said he might come to my talk that Saturday evening but in the end he was playing a space wargame with my roommate (from Durham) and another person from Durham! Until 5AM . . . Which probably didn’t help my roommate when he was unsuccessful in the Roborally final the next morning . . . The biggest surprise was how well people took to my 1942-43 World War II air and naval game that is vaguely related to Stratego. (Little-known fact: my game Swords & Wizardry, published long ago by H. P. Gibsons, is related to Stratego.) This game is immensely more fluid and strategic than Stratego, which is a very limited (few choices) mass-market kind of game. 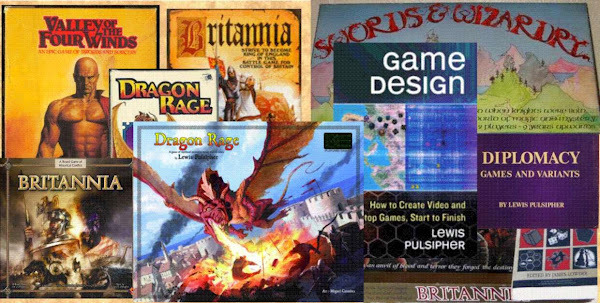 Beginning last year I volunteered to give a talk about game design at PrezCon. It’s not likely to be fertile field for such things, with so many long-time players. If they're intending to design, they've probably started long ago, and if they don't intend, then they wouldn't try to come to the talk. So I'd never expect a big turnout. Last year I had nine people, but we were in a ballroom with a lot of other people and it was so loud that sometimes even I, with a loud voice, had to stop talking. This year we were scheduled for the same room so I did almost nothing to promote the talk. It was not highlighted in the schedule as far as I know and was just one amongst all the listings of tournaments so I wasn’t surprised end up with five this time (and one of those had not seen it in the schedule, he just happened to pass by while I was waiting for people to turn up). Fortunately Justin had a nice room in reserve so we were able to move there from the first floor ballroom. Generalizations about conventions: GenCon is a story convention - not just story in games such as RPGs and story oriented boardgames, but stories of all kinds such as film, animate, and science fiction/fantasy. WBC/PrezCon are competitive game cons. Origins is a non-story mostly noncompetitive game con including boardgames, RPGs, miniatures, and CCGs. If you’re a competitive player of board/card games, and can go to only one convention, it would probably be this one or WBC. If you’re in the business, or if you’re a story-gamer, GenCon is clearly the number one convention. There may be competition conventions like PrezCon and WBC in the western part of the country, or perhaps far the Northeast, but I don’t know of any.